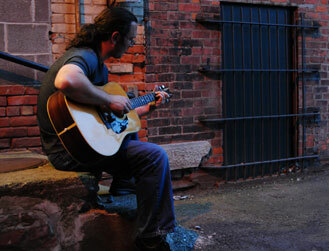 Greg Podoliak is a fingerstlye and blues guitarist based out of Elmira, NY. His playing style evokes textures of Leo Kottke, Michael Hedges, and Stefan Grossman with a myriad of underlying influences from baroque, traditional “American” melodies, Afro-American, Irish and even classical Indian music. In addition to live performance, Greg has also spent many years as a respected instructor to some of the most talented performers in upstate NY. With the release of his first solo full-length album, “Journeys & Travails”, he gives notice that powerful, moving music is in the craft of creation, not production. The album, released by Old Boy Records in 2010, is an instrumental adventure in the art of solo acoustic guitar. Greg is currently performing solo acoustic shows in the Southern Tier and central New York as well as preparing for the release of his second studio album. Greg is also now available for intermediate and advanced guitar instruction for students in the Elmira, NY area through Studios on the Square.